Who doesn't love a good Chicken Salad? 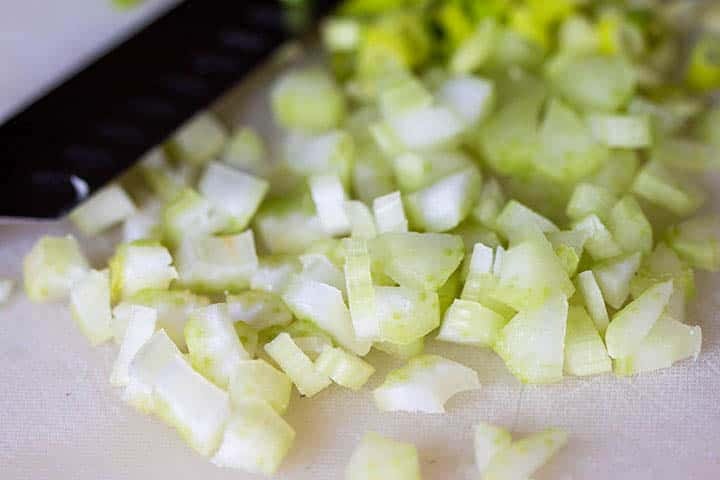 Once you try this one loaded with bacon, celery, and green onions, it will become your new favorite. Sometimes the best recipes are the simplest. 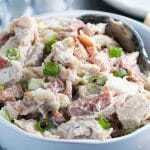 This easy recipe for Chicken Salad with Bacon & Green Onions uses only five ingredients, but packs a punch in flavor! Perfect for packed lunch or picnics, this recipe will become a fast favorite. In the world of sandwich fillers, isn’t chicken salad up there with one of the best? If you’re a fan of bacon, then this is the chicken salad of your dreams! It tastes fantastic and it’s so easy to throw together! 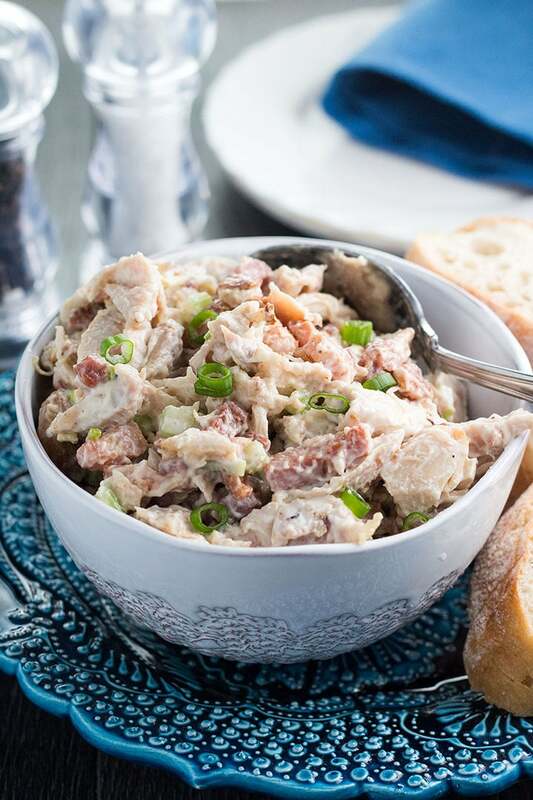 This Chicken Salad with Bacon & Green Onions makes the perfect lunch any day of the week, and its the perfect choice for a picnic, party food or brunch. So next time you’re planning a menu, don’t forget to think simple yet delicious! This recipe is inspired by my favorite sandwich from the best lunch spot in my town. It’s a place save for when we’re catching a train to London. The first time I went there, I thought there would be no way I could get a sandwich that came close to the delis back home in Jersey, but boy was I wrong. It was served on fresh baked bread and it was amazing! Every time I make this recipe it brings me back to the early days with my husband and the magic of visiting London for the first time. Having such a soft spot for this chicken salad, I don’t know why I waited this long to share it with all of you! 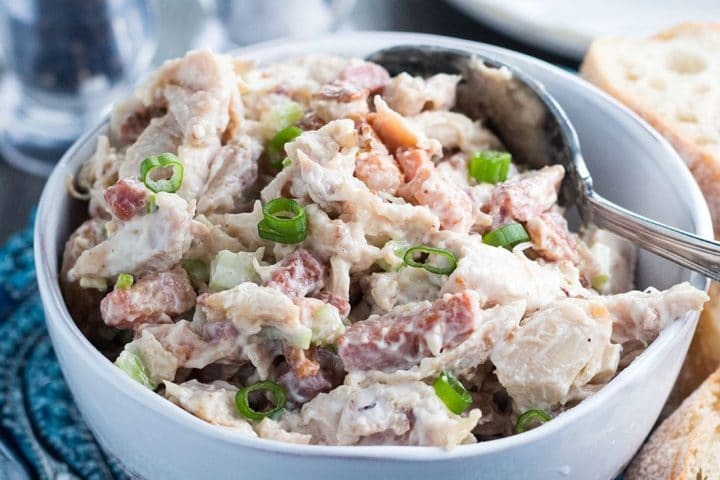 I know it’s pretty hard to go wrong with putting bacon in anything, but I’m not so sure it ever would have occurred to me to create this combination of ingredients, but with just chicken, bacon, celery and green onions – you get the best chicken salad you’ll ever have! The salty bacon pairs well with the tangy creaminess of the mayonnaise and the pungent flavor of the green onions. The addition of the celery adds fresh flavor and crunchy texture. It’s super simple to prepare and makes a great option for using leftover chicken. Start with cooking the bacon. I used thick cut, chopped bacon, but you can use what ever you prefer. Once cooked, blot on paper towels and set aside to cool. Cut the chicken into bite sized pieces. If you don’t have leftover chicken, cooled rotisserie or ready roast chicken from your grocery store works great! 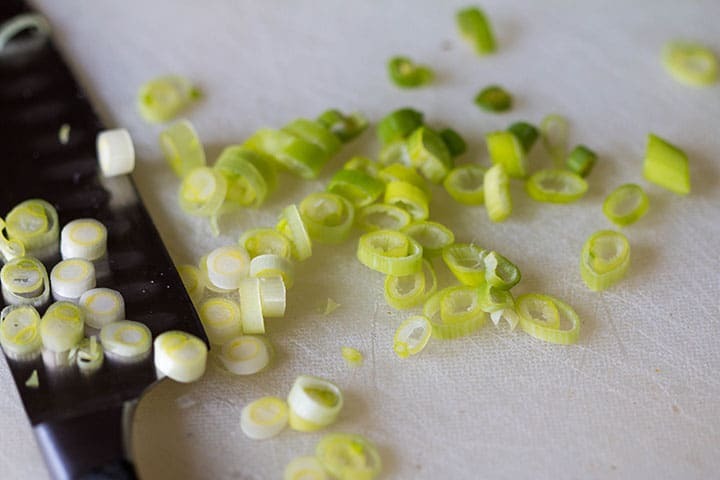 Slice the green onions into thin rounds. Dice the celery into small pieces. 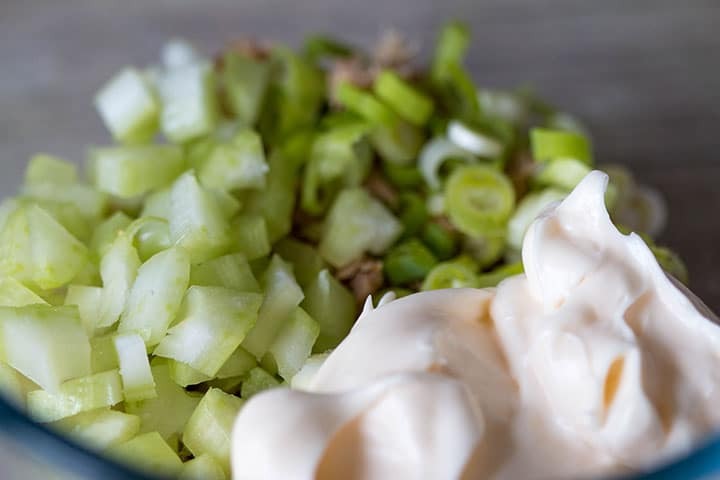 Add the chicken, green onions, celery and mayonnaise to a bowl. Season with pepper, but wait on the salt until you add the bacon as it may be quite salty. Mix well to combine. Once the bacon is cooled, mix it in and taste for seasoning before serving. Serve in a sandwich or top your favorite fresh bread. 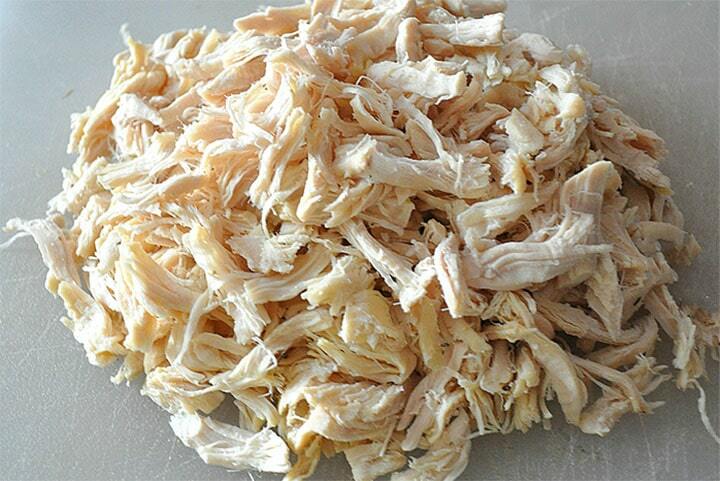 If you don’t have ready made chicken, the best, easiest and quickest way to get moist, easily shredded chicken for a salad is to poach it. If you’re not sure how to do it, check out this great article on The Spruce Eats. Not a fan of celery, but still want to add a crunchy texture? Try adding fennel or English cucumber. For a lower fat option, use low fat mayonnaise or a mixture of mayonnaise and non fat Greek yogurt. You can also buy lean bacon that’s trimmed of fat. 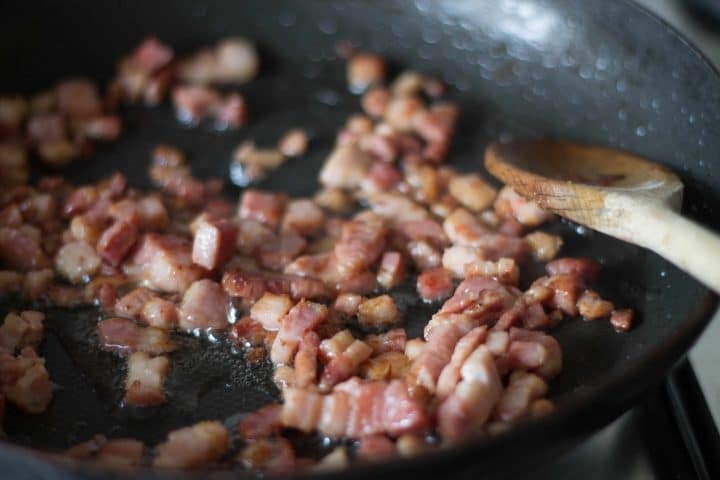 Start with a cold pan: Add the bacon to a cold pan cold pan before turning on the heat. Don’t worry about crowding the pan. Bacon will shrink as it cooks, just don’t overlap too much. Cook on medium high heat. Bacon cooks fairly quickly and can go from being brown to burned rapidly. Cooking the bacon over heat that’s too high also causes the grease to get too hot and smoke up the room. To prevent bacteria in food from rapidly growing, picnic food has to be kept at certain temperatures. The key is to not allow your food to sit refrigerated for more than 2 hours, or if the outdoor temperature is higher than 90° F, limit the time to one hour. In a skillet, cook the bacon over medium heat until crispy. Remove from the pan and blot to remove extra fat. Set aside to cool completely. Mix all the ingredients in a bowl, taste for seasoning and as needed according to taste. Mix well and refrigerate until serving. I have tried your chicken salad recipes. And it was really delicious. Thanks for sharing the amazing recipe. This is my very fav chicken salad! So good!! I love it too, Tina! One of my favorites! I couldn’t have thought about this sort of salad ever! It’s amazing! 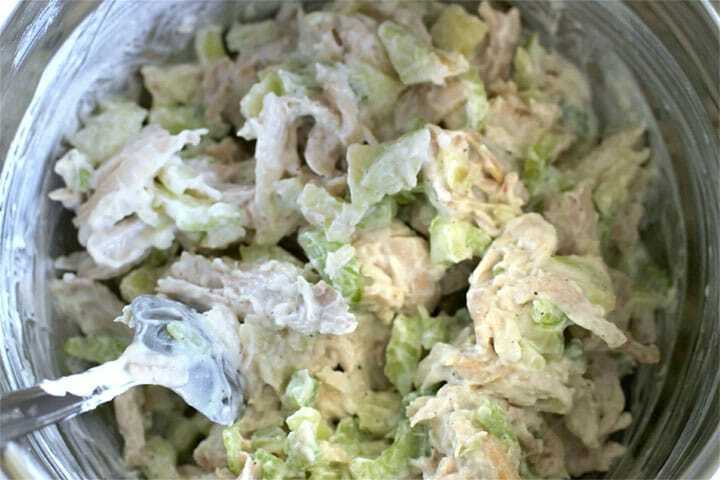 This chicken salad looks amazing! Can’t wait to try it.